I swear this isn’t a wine blog – I just happen to have tried another new wine tonight. I was excited about this one because so far I seem to have more of a taste for whites than reds, and I’d read a bit about New Zealand Sauvignon Blancs. Apparently they make a top class example of this grape style. Being a Friday, we went out for dinner up the street at the local restaurant strip. We went to Garfish, which is a moderately upscale seafood place, with fish bought fresh at the market that day. M. had the grilled salmon with chips, while I opted for roasted barramundi with polenta. These seemed to complement the wine very nicely. It was a pale straw colour, nothing too exciting there, and very fluid in the glass – as opposed to the thick streakiness I’ve seen in some wines. It took a while to identify the aroma, but once nailed down, it was quite definite. Tropical fruit – a hint of pineapple, and a stronger touch of banana. Yes, banana. In the mouth it was very different. It was acidic and citrusy, with a touch of lemon, developing into quite a powerful herby flavour. Nowhere near as strong as a herb-based liqueur like Jagermeister, but certainly heading in that direction. I really liked it, but M. preferred the Chardonnay we’d had a couple of weeks ago at the same restaurant. That one was a touch oaky, which is still a flavour I’ve not yet grown to appreciate. It seems clear I prefer my whites in this clean, fruity, acidic style. Very nice. 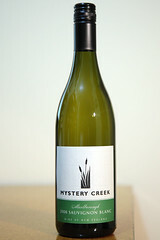 This entry was posted on Friday, 19 February, 2010 at 22:03	and is filed under Wine. You can follow any responses to this entry through the RSS 2.0 feed. You can skip to the end and leave a response. Pinging is currently not allowed.